Feb 18, 2019 Second Notes for Mac 1.7.1 is released. Fix the issue that the app is unstable when the last note is deleted. Fix the issue that the note info button doesn't work in some conditions. Feb 5, 2019 Second Notes for iOS 1.7 is released. Add the arithmetic button in the keyboard accessory. Change the minimum iOS to 10.3 and improve stability. Feb 5, 2019 Second Notes for Mac 1.7 is released. Add the arithmetic button in the toolbar. 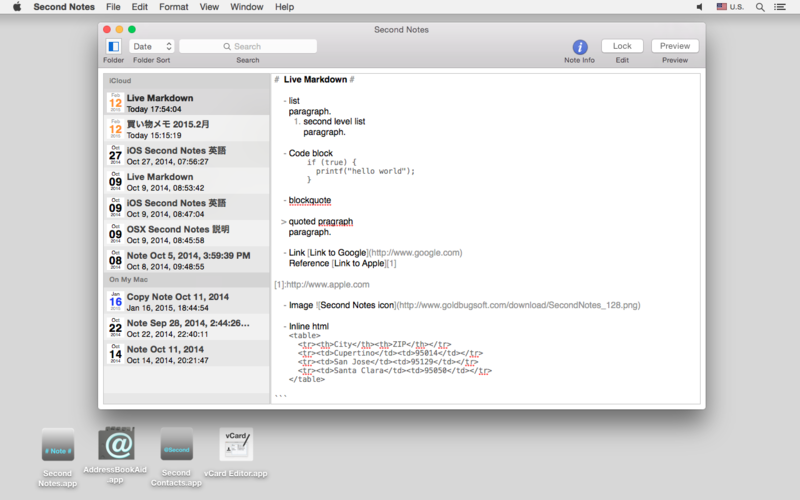 Add a function of showing folder in "On My Mac". Change the minimum macOS to 10.11 and improve stability. Jan 30, 2019 vCard Editor2 3.1.6 is released. Fix the issue that the "Replace All" function may cause a crash when the Birthday or Dates column is shown. Jan 29, 2019 AddressBook Aid2 3.1.6 and Second Contacts2 3.1.6 are released. Jan 24, 2019 vCard Lite 1.1.5 is released. The size of Contact Icon in the Contact Info View can be changed by the context menu. Fix the issue that the replace button in the Find bar does not work in some situation. Jan 20, 2019 vCard Editor is updated to 2.5.8. Jan 19, 2019 AddreessBook Aid is updated to 2.5.7 and Second Contacts for Mac is update 2.5.8. Dec 7, 2018 vCard Editor2 3.1.4 and vCard Lite 1.1.4 are released. Fix the issue that sorting in the phonetic name column doesn't work. Fix the issue that some textfield doesn't turn in editing mode when the cell is double-clicked. Add the context menu in the column header for selecting a sorting option. Dec 1, 2018 Bulk change function of AddressBook Apps. Our AddressBook Apps: AddressBook Aid2, vCard Editor2, Second Contact2 have a bulk change function. Nov 29, 2018 Find duplicate contacts by sort function. Our AddressBook Apps: AddressBook Aid2, vCard Editor2, Second Contact2 have a sort function. It is the best way to find duplicate contacts or data in your contacts. Nov 26, 2018 vCard Editor2 3.1.3 and vCard Lite 1.1.3 are released. Fix the issue that a Modified Email value is not reflected in the sort operation. Change the string of the context menu and localize. Improve undo/redo internal method and optimize the operation. Fix the issue that changing font size doesn't work when a window is switched. Oct 13, 2018 How to back up your contacts on Mac to vCard file. You can export selected contacts in your Mac to a vCard file as a backup. Several applications in our products have the "Show Fonts" in the font menu to show the font panel to select font used in the table. However the menu doesn't work in macOS 10.12. Mar 11, 2018 Second Contacts for iOS is updated to 1.6. The UI design is not changed but updating the internal codes by using Contacts framework.